The Fairytale Princess Gown is made of a very nice baroque brocade fabric and is fully lined. The Fairytale Princess Gown is a one piece dress that closes with laces in the front and back to ensure a perfect fit. 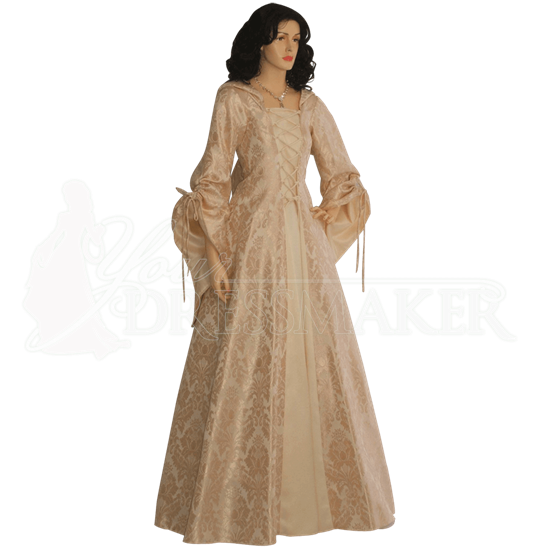 The Fairytale Princess Gown is great for Medieval Weddings, Renaissance Fairs and Medieval re-enactments. This dress is made with our brocade no 2 in light gold with a center panel of cream colored taffeta.